Here at Theremin World, readers often ask "which theremin should I buy?" We've created this handy guide to help you make your decision. 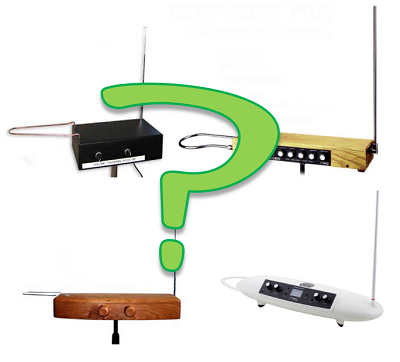 When deciding which theremin to purchase, here are some important considerations. Hands down, the first question most people consider is budget. Theremins come in a range of budgets, but the old rule "you get what you pay for" tends to apply. As with most musical instruments, the more you spend on a theremin, the (generally) higher quality the instrument will be. You can get a fun pitch-only novelty theremin starting around $25, though it won't really be suitable for making music. You can get a decent starter theremin that is suitable for playing simple melodies for around $120 if you're willing to build a kit. There are a few more durable and professional options in the $250-$500 range (Burns B3, B3 Deluxe, Moog Theremini, Moog Etherwave). Spend a lot more, and you can get a true professional model like the now discontinued Moog Etherwave Pro Theremin or the Tvox tour. Break the bank, and you can even buy a rare vintage RCA Theremin circa 1929! For most beginners who are serious about learning to play music on a theremin, we recommend the Moog Etherwave and Theremini models or the Burns B3 as a great starting point. Do You Want To Make Music Or Just Sound Effects? Consider what you want to do with your theremin. Do you aspire to play classical music? Or are you just looking for something to make spooky sound effects? Or are you looking for a little of both? Most single-pitch theremins and optical theremins available are best suited for simple noisemaking and not much else. These can still be a lot of fun, but don't expect to become the next Clara Rockmore with one of these. With a single pitch theremin, you cannot control volume between notes, which tends to be important when playing melodies. For that, you'd need an external control such as a volume control. Two-antenna theremins, on the other hand, allow you to control both the pitch and volume of each note. It takes a lot of practice to get both of your hands working together, but once you get the hang of it, you'll really enjoy how much control you can have over each note. If you're looking for a little bit of both, the Moog Theremini Theremin might be right up your alley. Featuring a digital synthesizer engine with built-in effects, it can produce a vast array of sounds from traditional theremin timbres to space-age oddities. If you want to make music on a theremin, look for one with great pitch linearity. Better linearity means the notes are spaced more evenly apart across the theremin's pitch range. No theremin is perfectly linear, but generally the more expensive models tend to have better linearity and are thus a bit easier to play. More expensive theremins tend to have better linearity, and are therefore more "playable". If you're considering a kit theremin, it's important to have at least a basic understanding of electronics and a little previous experience with building electronics kits. If you can follow directions closely and you are comfortable with a soldering iron, you can build any kit out there. Kits are also a great way to save a little money on a decent quality theremin. Even if you're not familiar with soldering, you might be able to find a friend or family member to help you build the kit. One great kit option is the Moog Etherwave Standard theremin kit. This is a great sounding two antenna theremin with decent linearity, and best of all, most of the soldering and tuning is already done for you by Moog engineers! You simply wire up the controls on the front panel to the main board and finish the cabinet to your liking. Or, if you're into modular synth gear, upgrade to the Moog Etherwave Plus theremin featuring CV control outputs! For the more adventurous, the PAIA Theremax kit requires much more soldering but can be a fun kit to build. You can do a lot with effects pedals, but it always helps to have some basic control over the sound generated by the theremin. Do you prefer a harsher sawtooth wave, or a more flute-like sine or square wave output? Be sure to listen to sound samples of a theremin before you purchase one to see if you like the overall tone. The Moog Etherwave is a traditional analog theremin and allows you to modify pitch and timbre via two knobs on the front panel. The Moog Theremini has a built in digital synthesizer engine. While it might not sound as "organic" as an analog theremin, it offers a wide range of sounds to play with. Virtually all commercially theremins these days are easily portable with removable antennas. The old RCA theremins, Big Briar series 91 or Ethervox models came in large wooden cabinets that looked amazing, but were fairly heavy. If you travel with your theremin a lot, consider getting a padded gig bag to protect it. This may seem minor to some, but consider whether or not you like how the theremin looks. Are you looking for a more classic shape like the RCA lecturn cases, something more utilitarian like the Moog Etherwave, or something modern and spacey like the Moog Theremini Theremin? Some theremins, such as the Moog Etherwave Plus, Moog Theremini, and the PAIA Theremax offer additional features like control voltage outputs for controlling analog synthesizer gear. The Moog Theremini also has a built-in tuner, effects and automatic pitch correction! A few accessories might be necessary depending on which theremin you pick. Most theremins can rest on a table or other flat surface, but mounting them on a standard microphone stand can help prevent other nearby objects from interfering with the space control zone. Note that the Moog Theremini theremin requires a special adapter in order to fit on a standard mic stand. You can connect headphones to your theremin (and your neighbors will probably really appreciate that), but an amplifier is critical for learning to play well or performing in public. We recommend a keyboard amp, as guitar amps are designed for the low signal strength produced by guitars and won't sound great with a theremin. The Moog Theremini has a built-in speaker that is handy for practicing, but it isn't loud enough for performances. Connect your theremin to an amp with a standard 1/4" instrument cable. We really like the 90 degree angle cables like this one for aesthetics. If you plan to travel with your theremin, we recommend a padded gig bag to protect it from accidents. The Moog Etherwave Theremin bag is affordable, features a pocket for cords and antennas, and is reasonably priced. It works well with most theremin models, even if you don't own a Moog. Finally, a tuner or pitch preview device can help you find the right note to kick off the song. Signal path tuners like the Korg Pitchblack work great. It has a bright display and an 8 octave range. We hope this guide has been helpful! If you have other tips to help or questions about which theremin might be best for you, please feel free to post comments or inquire in our forums.